Microsoft has started rolling out a new feature update to Windows 10 devices starting October 2nd. The update brings with it some minor but important features such as a clipboard. A similarly useful and major feature of the new update is the Windows 10 Your Phone app. Unlike previous implementations of linking your phone to your PC, this one provides a window to your phone right on your PC. It works with both iOS and Android devices now that Microsoft has given up on the Windows phone. It provides instant access to 25 latest pictures shot from your smartphone camera, lets you read and respond to SMS messages, and see your phone notifications. Users will be able to simply drag and drop photos from their phone onto their PC, even right into an app such as Word or PowerPoint. Obviously, the idea here is to keep you from switching back and forth between your phone and your PC. Or… to keep you switching back to using your phone which is not a Windows phone. Regardless of how you look at it, this is a convenience in the end and we’re all for it. You can see everything you need to see on your smartphone right through the app. This week we’re introducing a set of features and updates across a variety of devices and platforms and a better blending between web and application environments for end users and developers. Last year at Build, you heard us talk about our commitment to meeting our customers where they are – across platforms. We’re expanding this work to not only bring more Microsoft 365 services across platforms and into applications, but to better connect customers’ existing PC experiences with their phones, helping to increase engagement for developers. 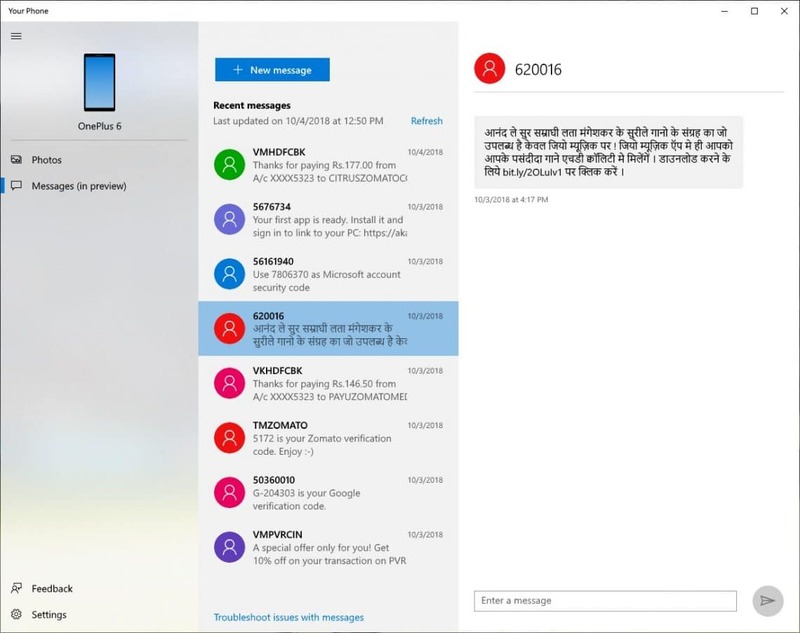 A new ‘Your Phone’ experience that enables a window into a user’s phone right from their PC for instant access to text messages, photos and notifications. Imagine being able to quickly drag and drop your phone’s photos into a document on your PC in one swift movement – without having to take your phone out of your pocket. 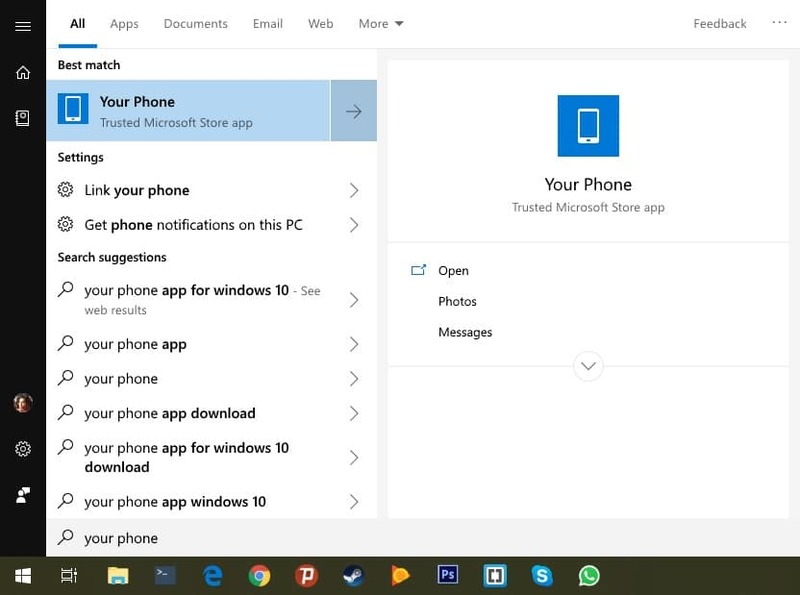 ‘Your Phone’ will begin to roll out in the Windows Insider Program soon. The feature has been in testing for several months since it was first announced at Build 2018 in May. It is now going live with the Redstone 5 update rolling out to Windows 10 devices. First, install the Your Phone app from the Microsoft Store if you don’t already have it installed. If you have the app, you’ll still probably need to update the app to the latest version. Open the app on your PC. Click Get started and then click Link Phone. Enter your phone number and then click Send. Launch the companion app on your phone and select My PC is ready, then tap on the Connect my PC button. Now tap on the Sign in with Microsoft button and sign in with the same Microsoft ID that you’re signed in with on your PC. When signed in, tap Continue > Done. Make sure to grant all the necessary permissions to the companion app. 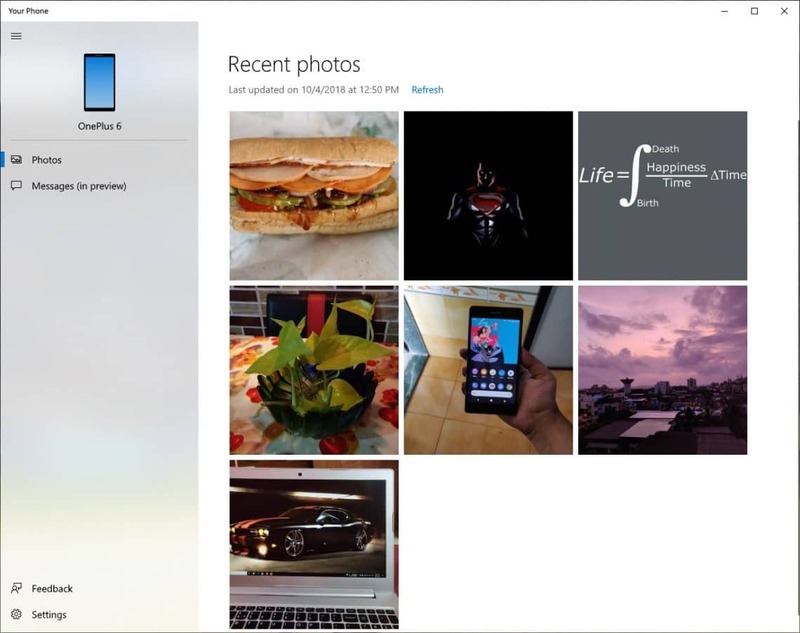 You should now be able to see your most recent photos and your messages in the app. The companion app also has links to all Microsoft apps available on Android that you can access by swiping up or from the menu drawer. There’s not much to the Android app so you can just forget about it. 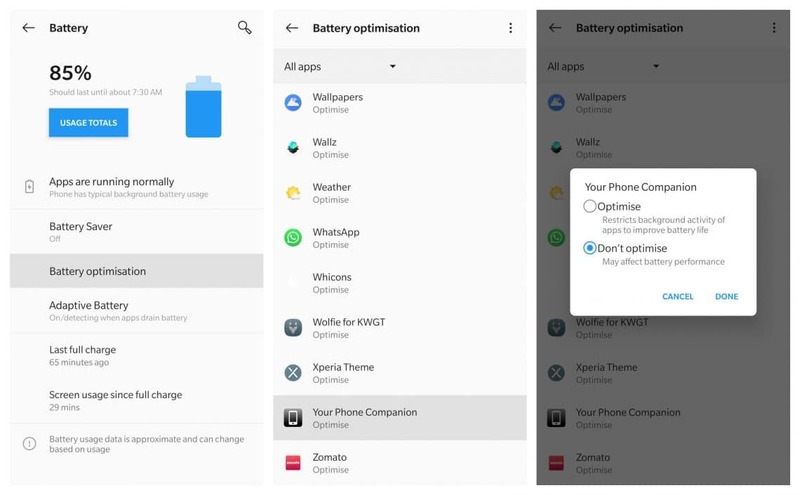 To ensure that it keeps running in the background, you may want to exempt it from Android’s Battery optimization. To do this, head over to Settings > Battery > Battery Optimisation. Scroll down to the bottom until you find the Your Phone Companion. Tap on it and select Don’t Optimise > DONE.